A Japanese art collector and billionaire fashion entrepreneur is paying SpaceX an undisclosed but "significant" amount to charter a flight around the moon as early as 2023 aboard the company's planned BFR rocket, a mission that will include a half-dozen other invited artists for what would be the first privately funded moon mission. "Ever since I was a kid, I have loved the moon," said Yusaku Maezawa, founder of ZoZotown, one of Japan's largest retail websites. "Just staring at the moon filled my imagination. That is why I could not pass up this opportunity to see the moon up close." At the same time, he said, "I did not want to have such a fantastic experience by myself. That would be a little lonely. I don't like being alone, so I want to share this experiences with as many people as possible. That is why I choose to go to the moon with artists! I choose to invite artists from around the world on my journey." Speaking to journalists and SpaceX employees at the rocket company's Hawthorne, Calif., factory, standing at the base of a Falcon 9 rocket in front of its nine engine nozzles, Maezawa said he is considering who might be invited, but no decisions have been made. "In 2023 as the host, I would like to invite six to eight artists from around the world to join me on this mission to the moon," he said. "These artists will be asked to create something after they return to Earth. And these masterpieces will inspire the dreamer within all of us." SpaceX founder and chief designer Elon Musk would not disclose how much Maezawa is paying for the trip, but said it was a "non-trivial" amount that will help fund the company's new BFR rocket, a huge, futuristic looking finned spacecraft designed to eventually accommodate up to 100 passengers on flights to the moon, Mars or beyond. Musk said Maezawa, who booked an entire BFR for the planned moon flight, is "a very brave person to do this." "This is dangerous," Musk said. "This is no walk in the park here. When you're pushing the frontier, it's not a sure thing. It's not like taking an air flight somewhere. There's some chance something could go wrong (but) we'll do everything we can to minimize that." Initial planning calls for the BFR to launch Maezawa and the invited artists-astronauts into an initial parking orbit before a rocket firing to blast the ship free of Earth's gravity on a trajectory toward the moon. The spacecraft then will loop around the moon and return to Earth for landing four or five days after takeoff. The BFR will use a trajectory similar to the one NASA's Apollo 8 crew followed 50 years ago this December on the first flight to carry humans beyond low-Earth orbit. "It's going to be very important to test this vehicle thoroughly before putting people on board," Musk said. "But I can't wait, I'm super fired up about this. It's amazing." Musk confirmed that Maezawa was one of the two passengers who in 2017 asked SpaceX for an around-the-moon flight using the company's Falcon Heavy rocket and the Crew Dragon capsule being developed to carry NASA astronauts to and from the moon. But SpaceX now plans to build the BFR, which stands for Big Falcon Rocket, a much more powerful launcher that could boost 100-ton payloads to Mars. Musk estimated the cost of the BFR's development at around $5 billion. The two-stage rocket is 387 feet long. The first stage is powered by 31 advanced Raptor engines burning liquid oxygen and methane. The winged upper stage is 180 feet long, features more than 1,000 cubic meters of pressurized volume and is powered by seven Raptor engines. Two of its three tail fins will change position during atmospheric entry to control the spacecraft's orientation, descent rate and trajectory before assuming a nose-up, vertical position and landing upright on its three fins. Musk said SpaceX is testing the Raptor engines and building components that will be used in eventual test flights. If all goes well, he said, orbital test flights could begin in two or three years. Asked how confident he is about meeting the 2023 target date for Maezawa's voyage to the moon, Musk admitted "we are definitely not sure. We've been pretty unsure about prior dates, too." "If I had some sort of crystal ball, I'd love to know how long something might take," he said. "But you have to set some kind of date." he referred to the 2023 target as a "things-go-right date." "There are so many uncertainties," he said. "This is a ridiculously big rocket, it's got so much advanced technology. It's not 100 percent certain that we succeed in getting this to flight. I think it's pretty likely, but it's not certain. But we're going to do everything possible to bring it to flight as fast as we can, as safely as we can." Musk went out of his way to reassure NASA and the Pentagon that honoring existing contracts to launch national security payloads, cargo missions to the International Space Station and Dragon flights to ferry astronauts to the lab complex remain SpaceX's top priorities. 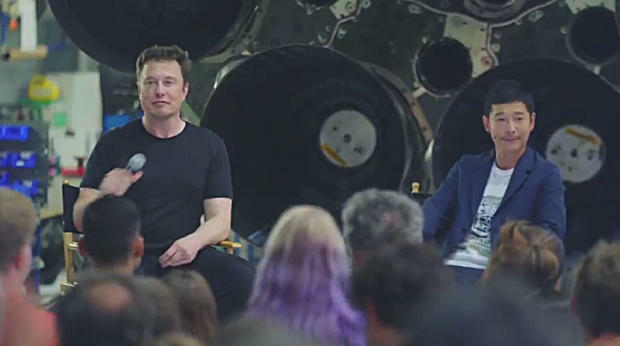 He said SpaceX currently devotes only about 5 percent of its resources to the BFR program, cut added that figure will ramp up quickly in the years ahead as the rocket matures. "The purpose for SpaceX, the reason for creating SpaceX was to accelerate the advent of humanity becoming a space fairing civilization, to help advance rocket technology to a point where we could potentially become a multi-planet species and a true space-faring civilization," he said. "As we consider the fossil record, the history of civilization, it's important to bear in mind there could be some natural event or some man-made event that ends civilization as we know it. So it's important that we try to become a multi-planet civilization, extend life beyond Earth and to do so as quickly as we can." Musk announced the moon mission three months before the 50th anniversary of the Apollo 8 flight that sent astronauts Frank Borman, James Lovell and William Anders on a flight to orbit the moon. That Christmas Eve, the crew famously read from the book of Genesis as they passed 60 miles above he lunar surface. It was the first mission to send humans beyond low-Earth orbit and it is still considered one of NASA's most daring flights. The Apollo 11 moon landing came the following July. Five more Apollo crews flew to the moon before the program ended in 1972. No one has been back since. NASA plans to launch astronauts on a trip into an orbit beyond the moon during the second flight of the agency's new Space Launch System rocket in the 2022 timeframe, nearly 55 years after Apollo 8.